Forgery, favoritism and corruption have enabled Telugus and Tamils (the South Indians referred to in the book) to dominate and ruin the U.S. IT jobs market, according to a new e-book published on Amazon. 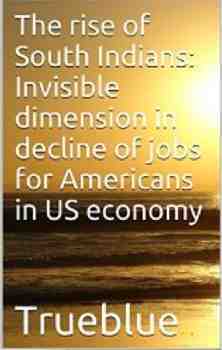 The title of the e-book is: The Rise of South Indians: Invisible Dimension in Decline of Jobs for Americans in US Economy. It costs $3.80 on Amazon. Although the book is riddled with vexing grammatical errors, it makes several valid points on the fraud pervading the H1B Visa program (which allows Indians to work as IT programmers and consultants in the U.S. for up to six years). Indians in the U.S. are already familiar with H1B Visa fraud since they are the ones committing them. But for the unaware, the book provides a quick overview of the growth of the IT outsourcing business in the U.S. and the ensuing H1B Visa fraud that has severely impacted prospects of American workers. The various illegal practices cited in the book will come as a surprise to a lot of Americans who have been misled into believing there’s a serious shortage of skilled IT personnel in the country. H1B abuses cited up by the author include benching, resume inflation, interview malpractices, fake degrees, ethnic bias in hiring, bribes and manipulation of references. The e-book is written against the backdrop of the U.S. proposal to grant Employment Authorization Documents to H4 Visa holders (i.e. spouses of H1B Visa holders) to let them work anywhere in any job. The author makes several good suggestions to fix abuse of H1B Visas such as not allowing H1B Visa holders to work at third party sites, charging a $5,000 fee to H4 Visa holders before providing them with employment authorization to work in the U.S and the need for vocational programs to train American workers. It’s no secret that South Indians dominate the IT jobs market among H1B Visa holders in the U.S. Among South Indians, it’s Telugus and Tamils who fill most of the IT jobs, be it at JP Morgan Chase, DuPont, Citigroup, Bank of America or hundreds of other organizations that rely on outsourced personnel to keep their IT systems going. Since there are far more engineering colleges in South India compared to the north, it’s no surprise that many South Indians are filling IT positions at most places, both in India and in the U.S. But fraud is not the monopoly of just South Indians. I’m aware of North Indians who too have committed various visa frauds. Because there are not many North Indians holding IT jobs in the U.S., their fraud does not attract attention. So it does seem unfair to pick on South Indians. A major issue with the book is the author’s ignorance of the basic rules of grammar. A third grade American kid would be better acquainted with the rules of English grammar. Be it punctuation, tense or spelling, the author is all at sea. How the author manages to communicate with colleagues or clients is a riddle, wrapped in a mystery, inside an enigma (thank you, Winston). Despite his ignorance of the basic rules of English grammar, the author has the temerity to attack Tamils and Telugus for their poor English. Another interesting point is none of the people from these states are proficient in English; they quickly attack ascent (sic) and grammatical skills of others but never look at their own backyard. A writer who doesn’t know the difference between ‘accent’ and ‘ascent’ or ‘their’ and ‘there’ has no business condemning others for their poor English. The second weakness of the e-book relates to factual and logical errors. For instance, the book says the “administration is subsidizing education more and more with each passing year” and immediately goes on to add that a graduate is unable to pay off his debts. Both can’t be true at the same time. Several studies have found that the cost of U.S. university/college education has soared over the last three decades and most students now take out huge loans. The book talks of “administration loaded of welfare benefits” for Americans. That nonsense is straight from a Republican talking point memo without any basis in facts. No, the Mughals did not rule India for 800 years before the British colonial era. I suggest the author read his 10th standard history book again. U.S. based Indians will learn nothing new from the book. I’m not sure American IT workers can do much even if they know of the massive fraud in the H1B Visa program because the balance of power is heavily tilted in favor of U.S. corporations that rely on H1B Visas. One glaring omission – The author fails to mention that the military-industrial complex is one sector where, for security reasons, Americans have a better chance of finding IT jobs compared to Indians. I know of U.S. programmers who got fired, retrained in new areas and now have stable jobs at military companies in Virginia. I got this e-book for free under the Kindle Unlimited trial program and read it on my iPad. If you have an Amazon.com account, you too can read the 43-page e-book for free on the Kindle, iPad or computer without forking out $3.80. 3 Responses to "South Indians have Ruined U.S. IT Job Market, Says New Book"
I would think abuse of H1B is rampant across different groups, not just the ones mentioned. But I believe desis are pushing the envelope in this arena. There was one I heard recently about interview malpractices, the plot goes like this – interview is conducted over Skype. There is a designated “interview taker” who attends interviews. They deliberately degrade the video and audio quality so it becomes hard to distinctively identify the candidate. Next a different guy shows up onsite to do the job, he gets remote support for a while until he settles in. “Interview taker” gets a cut from the deal. There are thousands of small desi owned bodyshops who are complicit in perpetuating this racket. These bodyshops typically are owned by folks who understand the H1B, Immigration, LCA, F1, H4, 485, EB1,2,3 loopholes well. Pick a resume inflate it and send it to the next bodyshop in the chain, get a cut – that is the basic modus operandi. How do you identify these shops – usually they have a tacky website with phrases like ‘world class offshoring’, ‘partners in excellence’ etc,. Under ‘locations’ you will see addresses in California, Virginia, Texas or New Jersey that look like an apartment, home or a small strip mall type office. You will also see a location in India – Hyderabad, Chennai, Small towns in Gujarat, Andhra Pradesh are popular locations. The author talks about the interview impersonation fraud and the remote support in the e-book but I don’t remember seeing any mention of the Skype video/audio degradation trick. These IT frauds never cease to amaze me. Be it the H1B,H-4 fraud, Nepotism, Cheap work ethics and the bluster and denial following it, these guys are becoming a parasite whereever they go. To top it all they spam endlessly bragging about their technical expertise in IT when India hardly pioneers any IT innovation. We escape by continuously pointing fingers at the fanciful notion of “Globalization”. This H1B scab saga is seriously gonna strain the relationship between the two countries. What’s perplexing is even a casual conversion between IT workers here always is about on-site opportunities. Even marriage pairings in middle class are determined based on the groom’s chances of settling in the west. We are continuing to be the architects of our own Misery with these actions and people are getting increasingly suspicious and angry about our character, the end is not far. 1. You write: Even marriage pairings in middle class are determined based on the groom’s chances of settling in the west. 2. It’s the corporation’s quest for cheap labor that has triggered this tsunami of H1Bs and the fraud that’s inevitable when you have Indians involved. BTW SI, I am not able to access the blog most of the times….Even if the site is accessible I am not able to comment. Once i click on the reply button, just a blank screen appears. Is there any other commenter facing this problem? I dont know if it’s an issue with my ISP. There are no issues here at this end, sweetie. We use a caching plugin and it works fine 95% of the time. Infrequently I see the message “Preload may have stalled.” It’s possible that in the rare instance it happens you may have fallen victim. I’ll keep a more watchful eye on this errant plugin, the likely culprit for the blank page.